After two years of searching and tests, we finally have a kids bicycle that we LOVE! 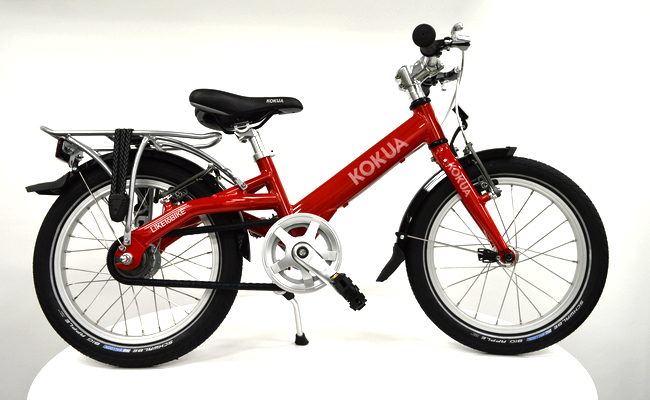 We are so happy to bring you the Kokua 16″ bike, which was designed in Germany, finally has everything we were looking for. A light & durable kids bike with excellent geometry, hand operated v-brakes, and all of the features we expect from a city bike, and even has optional fenders and rear carriers with elastic straps becoming the ultimate kids bicycle. At only 7.5 kgs, it may be the lightest on the market and you can even equip it with a SRAM two speed automatic internal hub (no cables, it shifts to high gear automatically at speeds over 9 km/h). It comes with amazing 16″ Schwalbe big apple anti-puncture tires (great for road and trail use), aluminum rims with stainless steel spokes, lightweight aluminum frame, aluminum crankset, stable central mounted kick stand, reflectors front and rear, no maintenance cartridge bottom bracket, Ahead set, child sized handle bars and grips, adjustable handle bar height, easy to use hand operated v-brakes front and rear which were designed for child sized hands, child friendly velo saddle, adjustable seat post and saddle positioning (move seat closer or further away from the handlebars) bell and even a chain runner chain guard which covers the entire chain. You can also upgrade to sks front and rear fenders and even a 10kg capacity rear carrier! Suitable for children 3 1/2 – 8 years with an inseam of 40-55 cm. I just wanted to let you know our bike arrived Thursday night and we love it! Thank you!